Many cancers grow rapidly and uncontrollably because their cells overrun the molecular brakes that normally permit cell to divide only when they are needed to replace old ones. These brakes are regulated by a group of enzymes known as cyclin-dependent kinases (CDKs). Alterations causing overactivity of two of these enzymes, CDK4 and CDK6, are found in a variety of cancers. So far, CDK4/6 inhibitors have been shown to be most effective in treating advanced estrogen-receptor positive, HER2-negative breast cancer. Combined with hormone-blocking drugs, the CDK4/6 inhibitors — including palbociclib, ribociclib, and abemaciclib — have substantially improved progression-free survival and response rates in this category of patients. 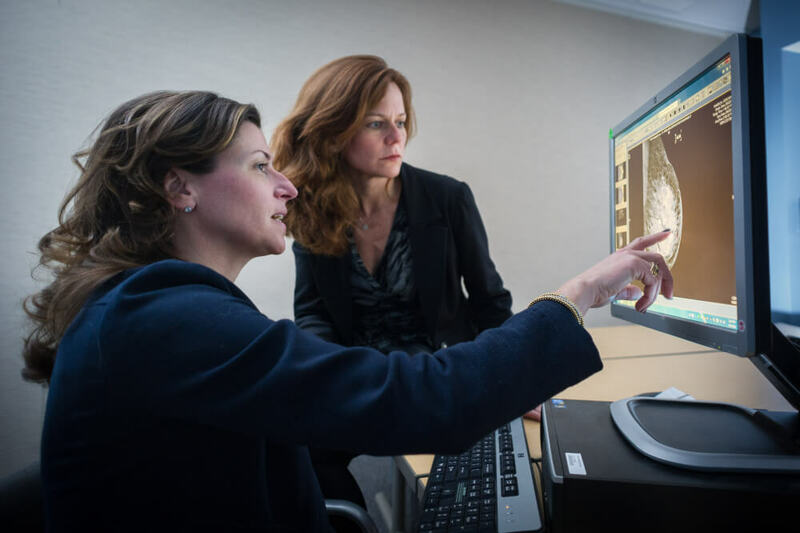 Dana-Farber breast cancer experts Ann Partridge, MD, MPH, and Tari King, MD, discuss results from a breast cancer scan. The drugs work by selectively turning off the overactive CDK4 and CDK6, according to Geoffrey Shapiro, MD, PhD, director of Dana-Farber’s Early Drug Development Center. By reducing the activity of CDKs 4 and 6, these inhibitor drugs restore the growth-suppressive properties of the retinoblastoma (Rb) protein, which is a control point for cell division. As a result, the cancer cells’ division cycle is halted, preventing them from proliferating. In some cases, the cancer cells not only stop dividing, but enter a state in which they lose all power to cycle and grow, after which tumors are able to shrink. Recent work by Dana-Farber scientists revealed that CDK4/6 inhibitors appear to fight tumors not only by blocking cell division, but also by unleashing the immune system to attack the cancer cells. Working with animal models of breast and other solid tumors, the researchers found that the CDK4/6 inhibitor abemaciclib stimulates the production of substances that enhance the presentation of tumor antigens to the immune system’s cytotoxic T cells, allowing them to recognize the cancer cells as foreign and swarm to the attack. The scientists also found that abemaciclib reduced the population of another subset of T cells in the tumor microenvironment, known as immune-suppressing T regulatory cells, thereby helping to free the immune response against the cancer. The research further suggests that combining CDK4/6 inhibitor drugs with immune checkpoint-blocking antibodies may improve the effectiveness of immunotherapy. So far, the CDK4/6 inhibitors have been shown to be most effective for estrogen receptor-positive breast cancer, and are only approved for wide use in that type of cancer. However, Shapiro says the drugs are demonstrating activity in other forms of cancer, including liposarcoma, non-small cell lung cancer, mantle cell lymphoma, melanoma and glioblastoma. In addition to combinations with immune checkpoint blockade, preclinical and clinical studies are underway in which CDK4/6 inhibitors are being combined with a variety of molecular agents designed to even more potently inhibit tumor growth and division. Learn more about breast cancer from Dana-Farber’s Susan F. Smith Center for Women’s Cancers.